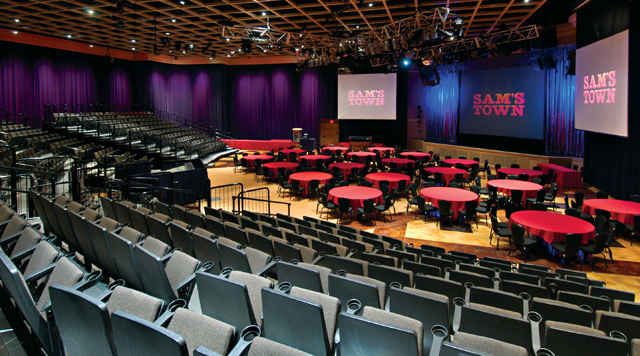 Come visit the premier live entertainment venue on the Boulder Strip — Sam's Town Live!, a state-of-the art, 1,100-seat multi-use facility. We offer an intimate setting for concerts and other events, and are capable of showcasing a variety of set-up options, including concerts, banquets and a nightclub setting. Sam's Town Live! has hosted a wide range of headline entertainers, including Joe Nichols, Leon Russell, Gladys Knight, Little Big Town, Boyz II Men, Uncle Kracker, Kenny Wayne Shepherd, LeeAnn Womack, Kenny Loggins, Lynyrd Skynyrd, George Jones and The O’Jays. Get Emails From Sam’s Town Live!